You’ve found the ideal job or internship. You’ve created a fantastic résumé. Now you need the perfect cover letter. Often overlooked, the cover letter is a key element in your application, because it gives you the chance to show potential employees why you are the ideal candidate. A great cover letter can make all the difference between getting that all-important interview or falling by the wayside. Read on to find out how to make your cover letter grab a prospective employer’s attention and ensures that you get that interview. Customize your cover letter for each position for which you are applying. Remember that a cover letter allows you to demonstrate that you know what the job involves, are capable of undertaking all the tasks to perfection and that you really are what the employer is looking for. Use this opportunity to show how closely your skills and qualities match the needs of the organization. Personalize each cover letter by including the name of the person who will read your application. If you’re responding to an advertisement, this information is usually provided. If not, it may require some research – but this shows initiative, a sought-after professional personality trait. Remember to address the recipient in a professional manner by using either ‘Mr.’ or ‘Ms.’ and their last name. You could also contact the company directly or the recruiter to ask questions about the position before the interview. This once again demonstrates that you are a proactive professional. Make sure that you’ve read the advertisement properly so that you ask useful questions that are in the ad itself. Use the information you have gathered to ensure your cover letter and résumé closely match the position. We also advise you to back up your research on the position with research about the company, so that you can tailor your cover letter and résumé carefully to ensure all the job requirements are covered. Visit the company website and do a simple name search to access company reviews, media coverage etc. that could further assist you in personalizing your cover letter by giving you an insight into the organization´s vision. If the company name isn’t in the advertisement, call the recruitment agency or advertiser and ask. Above all, look at the company culture. This will very much affect the way you should present yourself in the letter. Your name and contact details should be clearly visible at the top of your cover letter. A postal address is not necessary, but your email and phone number are essential. Your email address should create a professional impression. If you don’t have a professional email address, you can create one using a free email provider. Under your own name and contact details, you should include the name of the person to whom you are writing, their position, the name of their company and their contact details. Alternatively, you can use ‘To whom it may concern’, but it’s best to use this only as a last resort. At the start of your cover letter, you must state which job you’re applying for. You can either do this as a sub-heading (for example, ‘Regarding: Application for Marketing Manager Position’) or include it or add it to the first paragraph. Include a brief summary of your skills and experience, ensuring they match the job description as closely as possible. A short bullet list is fine. If you’re answering a job advertisement, there may be a position description that lists the essential criteria of the position. Your cover letter needs to respond to as many as possible of the requirements listed in the position description. Rather than simply listing skills or experience, add a phrase that explains how you acquired each of them. Then you should explain why your skills make you the suited candidate best suited for the job. Another useful tip is to use industry-specific language to show that you understand the field, whether it’s marketing or accountancy. For example, if the job requires certain accounting tools or programming software, mention it in your cover letter. Similarly, demonstrate that you have taken the time to research the company by mentioning achievements or other aspects of the company that you admire. Your cover letter should conclude by inviting the potential employer to read your résumé, and ask they contact you regarding an interview. Always check your cover letter for spelling mistakes and grammatical errors. These should be avoided at all cost. If possible, it’s always a good idea to get someone else to read it and point out any mistakes or confusing phrases. Try to re-word the information in your résumé, rather than just repeating it. Try not to overuse phrases like ‘I believe’, ‘I have’ and ‘I am’. Remember, it’s not about you – it’s about how hiring you would benefit the employer. Once you’ve written the first draft of your letter, read over it, and try to take out or rewrite sentences that start with ‘I’. Your letter should aim to convince the employer that you really want this job. Even though most employers will assume you’re applying for more than one job, you don’t need to mention it. So, show passion! 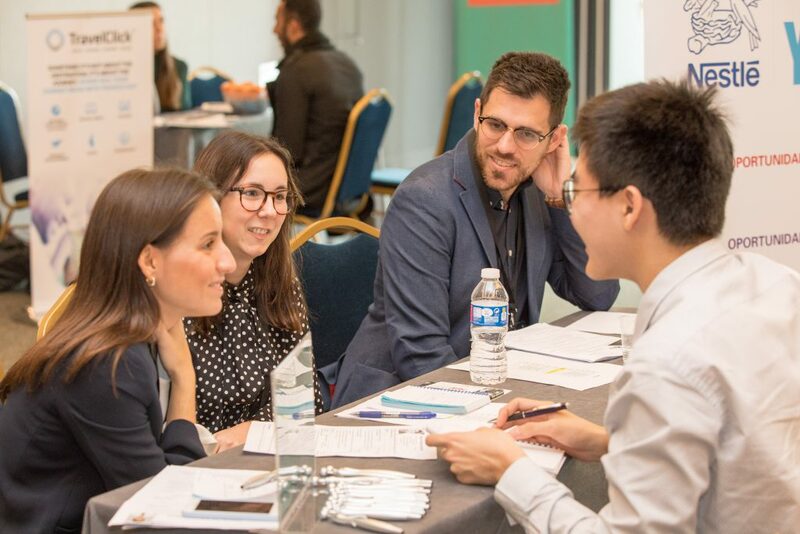 As an EU Business School student, you can consult EU’s Career Services department to assist you with compiling a résumé and writing a cover letter suited to the position you wish to apply for. At the annual EU Career Fair, there are workshops and other events geared towards improving your interview and application skills. Don’t miss out!